Definitely voted No. Noted with thanks Simone. I voted NO. If this woman really loved this chimp, she would have placed it in a natural habitat with other chimps, or an environment where it would be free to be in nature. This woman said the chimp sometimes slept with her, she served it wine and had even had the chimp on anti-depressants. No wonder this ape went berserk. She was trying to make it act like a human and was stifling its basic chimp nature. Cesar Chavez would have a field day with her. Authorities are considering bringing charges against this woman. Plant trees for life on earth. Wild animals are just wild animals. It does not matter how well ' trained' they are. They are wild and should be left in their natural habitat. voted no-79% say no now! Marion, I feel this woman really did love the chimp. Not all love is good or healthy, this includes our love for animals. IMHO. I agree after this horrible attack (and others) that wild animals should not be kept by people as pets. It's not fair to the animal in any shape or form. I live in CT and have followed this story very closely. My heart goes out to all concerned. This woman will never be the same again, her injuries are life altering, Travis is gone and the owner is in her own hell right now. if animals trained humans to be like them!! to learn the ways of animals!! smart enough to even try being like us!! La Luna ~ I'm glad you mentioned this because in no way do I think this woman did not love her animal. I know she did. My point is I think she may have loved it too much. It's a horrible lesson that others can learn from. Marion, I think you are right in saying she loved Travis too much. Her husband died 5years ago and her daughter was killed in an accident. Yes, she loved Travis way, way too much. He was her companion, as my 2 cats are mine. She had lived with Travis for over 10 years. He drove her car, more than once, now that's a smart monkey! How sad for her. It is a HORRIBLE lesson to learn! My state of CT has a law into place about such animals that Travis was grandfathered into. No other chimp permits have been asked for or given since the law came into place...not sure how long ago, but since Travis was 14 and the owner had him for 11 yrs guess it hasn't been so very long ago. People are smarting up..IMO. Look at all the wonderful, caring, animal loving people we have here at care2...now that's saying something! BIT OF ILL FRAZED QUESTION?are we talking about all wild animials or chimps like basicly no but what about the wild injerd owl taken into care never able to fend for itself again thro injury or cant fly properly ever again providing its space its compaions food care attention etc well an satisfacterily given then tis for the best the deer that gets hit on the road and has perment damage cant walk jump properly etc providing all its needs are met tis the best, especialy if in long time care like it depends on the situation. most times after long time care its inapropiate to return to wild if said animial cant cope or will be regected./as for say captuering and keeping for no other reason but to posses its wrong.and we all know where poss reard abaondend sanctuary animials , where poss are re traind to fend for selves and if sucesfull are re intoduced to their natural habittat/group/herd/ etc. if not poss then they inadvertantly are classified as their keepers pets/. I hope Gross Tete, Louisiana and the Iberville Parish are taking note since they have just done the same thing with Tony. Tigers, lions, bears, elephants, wolves can never be completely domesticated. Iberville has just voted to allow Sandlin to keep the tiger, in effect, grandfathering him in in spite of the fact it is now against the law. The same thing as with this woman. He has also had numerous USDA violation and has had the tiger for fifteen years. It is tragic for the human victims and the animal victims but it is HUMANS that are responsible for letting this kind of thing go on. I hear you Sue Little...Bombth B. No!, I have no idea! Sheesh. Anyways, Pauline, I think caring for a wild animal like an owl, which is a bird of prey should not be kept, but I do understand what you are saying and there are many grey areas. Pauline ~ Injured animals are different and should be cared for until they are able to go back to their own environment, I think. It just seems selfish and cruel to the animal to keep wild animals in a cage if they are healthy. I agree with La Luna that there are gray areas that should be considered. I see you have been or are involved with animal rescue. Good for you!!! It's a wonderful, compassionate gift for our animal friends. I voted no. This chimpanzee should have remained in his natural habitat. I feel so sorry for both victems. No matter if it is wild, a pet is a tremendous loss! I hope they both recover both mentally and physically. Wild animals are just that. I really don't want to have one in my home, and have to worry about if it would turn on me. And you just never know, do you? I understand that people can get to love their animals too much, but, just like the dogs, and the baby who got killed , dogs, are dogs, and one should not forget that. So, no I will stick to cats and dogs. The poll has changed since everyone here voted. It as 49% yes, and 51% no. Sharen brings up really good points. Some years ago, a woman in CT fell asleep on the couch to be wakened by the screams of her toddler...who was attacked while she slept by their dog..because of the childs diaper. The dog did some real damage to the child. We can never forget about the animals...that's just what they are. Although I think my cats are more than something special and different..they are cats. I mean, look what humans do to humans...and we ain't wild animals..??????????? absolutely not.. Wild animals are not pets... they belong in the wild.... and we have to make efforts to ensure that they stay there. I voted Yes, because it is not a yes or no question. my ferret is a wild animal and so is any one else who ones one. The sweetest wild thind the is. Animals are all different. Some are dangerous some are not. Personally speaking..I think its wrong to domesticate a wild animal..of any sort..I dislike even seeing birds in cages so much..just seems so sad..Dogs and cats..well we have domesticated them already..Even a dog or a cat can turn..and also sadly so many of them are abandoned.. I know many who will and do house all sorts of wild animals..however..that doesn't make it right..They are wild and they are meant to be free..They are not our playmates..nor should they be.. This woman I am sure loved Travis..but to me it seemed like a selfish sort of love..Just because we want something doesn't mean we have the right to take it away from its natural home.. and or we think we can make it better for them..but I feel it takes away their natural way of living..Some times you just have to truly love enough to let go and simply allow it to be what it is..and not what one wants it to be.. Very sad..for the human and for the chimp..very sad indeed..and far too many times this happens..
NO, wildlife should belong in the wild and not doing tricks in commercials, not being kept behind bars or in barns. Righteous humans with true love are loving wildlife in their own environment, because this is the only right way! Of course I voted NO. This can be a huge debate. Personally I would say that no wild animal should be domesticated in the first place. A wild animal being "domesticated" is not free anymore. In reality they are hostages and eventually killed because they became too "wild" for the owner. Can you imagine the "Wild Animal Mills" (puppy mills) shooting up and they just see profit. Practically it will not work. Injured wild animals is a topic on its own. One must always help an animal in pain and take it back to the wild if it is able to survive on its own. Wild animals should remain FREE, but it is always human laws that restrict their freedom. Now that I am thinking of it, goodness, us humans really have a cheek! I am still thinking. Did the lady sincerely love Travis?. She must have loved it in a special caring way. Or perhaps enjoy the attention she herself received from the public because of her clever and cute Travis. There is s difference when you love an animal. Some people use the opportunity to make money from their cute animals. My Babsie (daschund) had this unusual chocolate brown colour coat (not the usual red-brown ). I was offered lots of money if I could breed with her and only sell off the rare colour puppies. Guess what, the next day she went for spaying. Julie, I agree that many people may do just that...try to gain attention from a pet, in this case I am not quite sure. Travis was beyond the cute cuddlie monkey, that was easy to transport and show off. In news reports it was said he was very well cared for and his play things were all around the house. Maybe in the beginning it could have been the case but seems like this woman went to a great deal of trouble to care for the chimp. There are reports coming out this morning that Travis had shown aggression a few years ago, bit a woman on the hand and tried to drag her into the car when she tried to shake his hand. I haven't seen anything on how this woman acquired Travis. We need to change the laws for these animals. For our sake as well as theirs. I feel if you have a squirrel or raccon, skunk etc that lives in your yard that you feed and it allows you to pet or hold it but you do not capture it or pen it that should be legal. but I believe taking any animal from the wild where it is penned or kept in a way that is not its natural habitate that it should be ilegal. Wild animals should be left wild. My take on the owl responses. I worked in a wildlife hospital in England. Our criteria was that all animals once treated had to be capable of being returned to the wild - we were not an animal sanctuary. So if a wild animal had to have a leg amputated - say, a deer - then it was euthanised as its chances in the wild were negligible. There were a couple of instances where we had battled, sometimes for months, to save an animal and we would still have not been able to return the animal to the wild and we made the decision to keep the animal and let it help us with education. There was a Little Owl who still had to have a wing amputated after months of rehab. He had become very friendly and seemed to enjoy the company of people. He was not kept as a pet, however, but touched thousands of lives in our efforts to raise awareness of wildlife and the problems they face on a daily basis. Something the owner aparently didn't understand about Chimpanzees--a mature male becomes aggressive for many reasons the primary ones being sexual, dominance and territory. She tried to turn this Chimp into a human. That can never happen--no matter how much one learns or 'mimics'. They will ALWAYS be a Chimpanzee and with all their instincts intact. I think she blinded herself to the facts and responsibilities through her love for him. Wild animals should remain wild and not warped by our human needs, views or manipulations. I feel sorry for Travis and for the woman he attacked. But the 'owner' is at fault here, not Travis--he was doing what was his NATURE to do. When will people learn that wild animals are wild animals? No-one should have one as a pet unless they have a special licence. A licence should only be given to a wildlife park, large animal rescue etc where they are regularly inspected. An indiviual is unlikely to havet he experience or facilities to keep an animal. This is what we do in the UK. However, there are animals that appear to slip through the net, scorpions, spiders, snakes, reptiles etc. The handlers often have an extremely good knowledge of them and would be invaluable in helping. In the meantime, common sense and intelligence would demand that we do not strip the environment of rare animals as listed in CITES. the nail on the head!! a daughter & her huband died. the empty holes in her life. more than a jail sentence. Just voted no, gads, it's now 53% yes, and 47%no. Why? Wild animals are always wild animals, magnificant animals. No matter how much we think we have domesticated them they are still wild animals. It is not fair to the animal or the people around them to try to make them a pet. Especially in our "civilized" world. If a person lives far from civilization and wants to befriend an wild animal, not confining the animal is a completely different thing. The animal should be able to come and go as it pleases. It isn't fair for the animal. This poor chimp lost it'e life because a human tried to keep it as a pet, I know she had to love Travis but giving him his freedom would have been a greater love. Susan B ~ What a beautiful story about life at your animal hospital! Thank you. I voted no. wild animals are not meant to be pets. I blame the scientists that brought the chimpanzee here decades ago. They sold baby chimps to anyone that wanted one. Now, scientists just sell, or lease them out for experiments to other scientists. 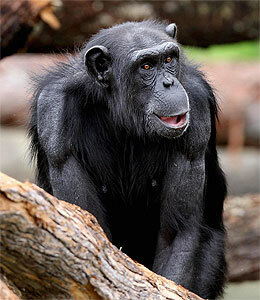 The history of the chimpanzees and how they got here is worth reading about. I agree with Patricia, Travis should of been put in a sanctuary, like Save the Chimps, or Primarily Primates, or Northwest Chimpanzee Sanctuary. I voted no , but i also wrote a letter to the AP news service where i first saw this cartoon to tell them i was saddened and angry by it. The woman has been transfered to a facial transplant clinic. Marion, you are right, Susan B's story was a really good one! Voted , NO . Thanks !! I did vote No, but I think there is one exception. If the animal was born in captivity (eg a zoo) and cant fend of itself- then it will need to live in cpativity. Thanks for the update, La Luna. Hopefully the victim will make a full recovery. However, she has lost both eyes and nose, I'm told. Tragic story. Marion, her jaw or part of it, also. That poor woman! A very long long road for her. Julia, yes you are right. My concern is the average person being able to own a chimp or tiger simple because they can afford to purchase one. Why are those who vote "Yes" winning? RARE incident? Listen....These are not domestic animals,nor should they ever be made to be. As for exploiting them for commercial gain...?...don't get me started. I despise people who attempt to anthropomorphisise animals.NO! These animals belong in the wild.Utterly ridiculous to assme otherwise. No. Keep wild animals in the wild. Thats' where they are at home and truly happiest. The only reason we keep cats, dogs, and the like are because they've been domesticated for a few thousand years, and I wouldn't start with any other species at this point in the game with the natural world being in the poor condition it is currently on this planet. the yes vote will never win, it seems someone has a bit of time on their hands... lol what some people won't do to "win"
I haven't talked to anyone who believes the wild animals should be held in the home like that, and very few in any forum on-line. sadly, the end is still the same, the poor woman has been harmed to a degree we can't even imagine, and Travis will always be gone. no, don't worry about the vote page, just worry about the rest of the people who hold wild and potentially dangerous animals in their homes. pray for their children. It just seems selfish and cruel to the animal to keep Wild animals in a cage if they are healthy. Even birds should not be kept in a cage. I voted no! Thank you for posting this poll! Noted! This people are crazy.. wild animals belong in the wild!! Noted and voted NO. Thank you for sharing this! Is there no end to human stupidity and ignorance regarding animals...? We really need to keep voting on this. No matter how many are foolish enough to vote yes here in this poll..be assured it will not make any difference in the outcome.. They will pass this law..and rightfully so..It is what will best serve the primates as well as humans.. They must protect these animals..as well as being responsible humans..and keep them free from harm and danger.. I voted yes, domestic animals are truly wild, and we keep them. They used to be wild before they were domesticated. But they have to have good food, shelter, etc. and maybe your not allowed to have things like elephants, dolphins, great apes, etc. because they can be dangerous and its cruel to keep them in captivity. If wild animals belong in the wild, so do domestics. Anyone who says I'm dumb, wrong etc. YOU'RE DUMB! "If wild animals belong in the wild, so do domestics." That sort of thinking is what the extremists think..Regardless of what was once wild..there are many animals that are now domesticated..and have been for a very long time..Rational thinking clearly tells most of us that these animals now would not survive in the wild..And most of us care deeply enough to give these domesticated animals a good home.. There is a big difference between dogs and cats..and or elephants and lions..So to those who foolishly vote yes here..well lets just say extreme and most foolish..